Posted on Sat, Mar 10, 2012 : 8:22 p.m.
Michigan's Zack Novak battles Ohio State's Jared Sullinger, left, for a rebound. It's not a battle Michigan won often in its 77-55 loss in a Big Ten Tournament semifinal Saturday in Indianapolis. INDIANAPOLIS -- When the Michigan basketball team scored one of its biggest signature wins of the season last month, Jordan Morgan put together the biggest performance of his career. Morgan recorded his first career double-double, 11 points and 11 rebounds, against Ohio State sophomore big man Jared Sullinger in Ann Arbor, helping the Wolverines grab a 56-51 win over the Buckeyes. On Saturday in Indianapolis, Sullinger returned the favor -- in a big, big way. "You make him catch it outside the paint, you be physical with him, you make him shoot away from the basket and take tough shots," Morgan said of defending Sullinger. "And then they just drop. "There's really nothing you can do about it. He just refused to lose." Playing with an edge he didn't show in two previous meetings with Michigan, Sullinger showed off his full package of low-post moves against the Wolverines during the game's first 10 minutes. He began the game 4-for-4 from the floor, hitting a fade-away baseline jumper, a turnaround hook, a putback and a face-up 15-footer. From there, the brutalization only continued -- as Sullinger was constantly guarded, but never stopped. Shot after shot found its way in, and the Buckeyes' big man finished the first half with 16 points on 8-of-10 shooting. "Jared was amazing," Michigan sophomore Tim Hardaway Jr. said. "He was definitely playing like his life was on the line, like he was a senior out there. Making every basket, making hook shots from 13 feet. I feel like he had our whole game plan in the back of his mind and planned out. "That's why he's Jared Sullinger, that's why he's a great player." Already at a size disadvantage against most clubs, Sullinger's ability to dominate, and Morgan's struggle to respond (he went 1-for-5 with three turnovers) put Michigan behind an even bigger eight-ball Saturday. With Sullinger doing whatever he wanted, Ohio State sophomore forward DeShaun Thomas was allowed to roam free, dropping in 22 points on 10-of-15 shooting. William Buford also hit a pair of 3-pointers, and Aaron Craft found his way into the lane as well. But in the end, everything ran through Sullinger. In Ann Arbor, Sullinger went 6-for-14 from the floor for just 16 points. In Columbus, he battled foul trouble and only had 13. In Indianapolis, he dominated the game from start to finish -- putting the Buckeyes into the Big Ten Tournament finals, and sending Michigan home to watch the NCAA Tournament selection show. And, on Saturday, there wasn't one thing the Wolverines could do about it. "He just refused to be stopped," Morgan said. "We just struggled." Michigan coach John Beilein questioned his team's decision-making on Saturday. When things started to snowball against Michigan in the first half Saturday, Wolverines coach John Beilein could sense a bigger problem growing on the horizon. His club was doing its best to hit shots that counted for five to 10 points on each trip. The only problem, of course, being that those type of shots don't exist in the game of basketball. "Everyone on our team will learn about, what we call, hitting singles," Beilein said. "When we got down early, a few guys tried to be heros at that time. "If we were going to get back at that game, it was going to be a lot of singles being hit, two (points) at a time." Perhaps the most glaring example of Beilein's frustration came after the Wolverines had cut the Buckeye lead down to seven, but struggled to keep any momentum. With OSU in the midst of another 10-2 run, senior guard Stu Douglass attempted to find Hardaway on a fast-break lob, rather than calm the play down for a more controlled shot. After that turnover, Douglass forced a nearly 30-foot 3-pointer, prompting Beilein to not-so-quietly question what exactly the team was thinking at that time. "Whether it was a fast-break lob or just 'I've got to hit this 3,' our kids care a lot," Beilein said. "They want to do it as fast as they can, they want to fix things. And sometimes that's our own worst enemy." Burke was saddled with two first-half fouls for just the second time this season. Earlier this year in a double-digit loss at Iowa, Burke picked up two fouls early and remained on the bench for the duration of the first half. Against Ohio State, though, Beilein elected to re-enter Burke into the game with the two fouls and more than seven minutes left before the half. The strategy didn't work, though, as Burke never found a groove, and continued to struggle against picking up his third foul. "(Getting two early fouls) is terrible," Burke said. "Because you really can't play the type of defense that you need to play. "You have no choice, and then on offense, you can't really go to the rack and be as aggressive as you want to." Saturday marked the first time all season that Michigan had lost a game while wearing its white uniforms. The Wolverines are now 8-1 in those jerseys. ... Michigan walk-ons Corey Person and Josh Bartelstein combined for 10 points in the game's closing minutes. Person had a career-high seven, while Bartelstein connected on the first 3-pointer of his Michigan career. ... Zack Novak played 35 minutes Saturday, and is now 42 minutes away from breaking Louis Bullock's school-record for minutes played in a career (4,356). Sun, Mar 11, 2012 : 7:46 p.m.
THIRD straight year TOSU has knocked the weasels out of the Big10 tournament. Getting like when the Vest went year in and year out winning. Once our red headed step child always our red headed step child. More like a female dog ( bit$8) but they would flag it. . The difference in talent is off the charts. This is just a preview to how things will look once Urb gets things in high gear. If weasel fan is not concerned they are ignorant regarding sports or in denial. This was like a high school team against a college team. I missed on my prediction that they would take them by only 15. Nice to win but even nicer to give the wood to the weasels. Sun, Mar 11, 2012 : 6:11 a.m. So much for the sign in the locker room about being the strongest team in the B1G. Better hit the weights boys cause Sullinger made you look silly. Not Pretty! 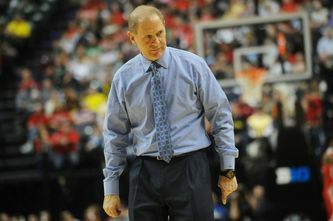 Sun, Mar 11, 2012 : 12:04 p.m.
Michigan's Achilles heel has always been the lack of a top-notch big man. Nine times out of ten they're going to get steamrolled by a team with a player the size and caliber of Sullinger. Morgan and Smotrycz are good solid players, but let's see what happens next year when Mitch McGary comes in. Hopefully he'll give Sullinger a run for his money, next year if we're lucky, or the year after that if Sullinger is still around.